Thick acrylic sheet (also referred to as thick Perspex sheet) is a premium grade of acrylic block offering excellent clarity in a range of sheet thicknesses. 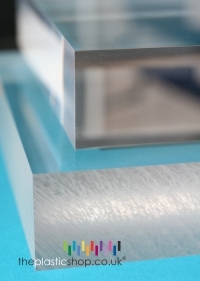 You can buy clear thick acrylic sheet cut to size, or in full sheets - with the further option of perfect polished edges - this means that each cut edge of the acrylic panel is polished to a high quality clear transparent finish. Thick acrylic sheet has light transmission in excess of 92% - it is superior to all other thermoplastic sheet and higher than that of glass. Thick acrylic sheet can be safely used outside although its performance may be affected through UV exposure over time. - For thickness tolerance of thick acrylic sheet, please see 'More Info' tab below.